FREDERICK, MD-It is time to warm up those vocal cords or start practicing on your instrument of choice! 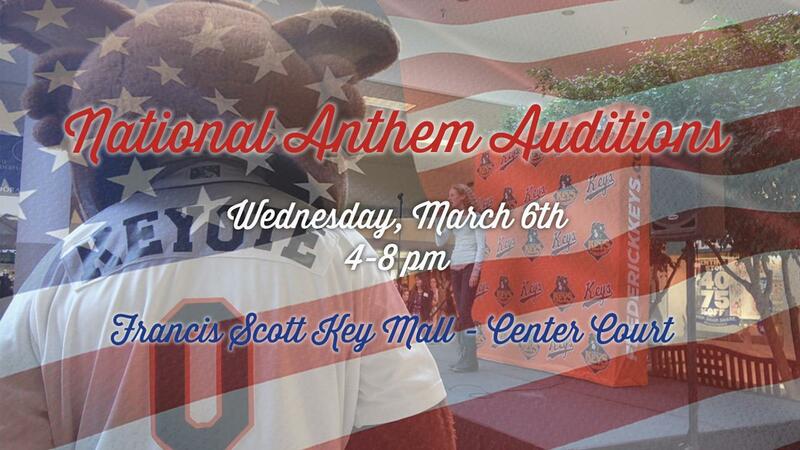 Frederick Keys national anthem auditions have been scheduled for Wednesday, March 6 from 4-8 p.m. Auditions are slated to take place at the FSK Mall in Center Court. "Great national anthem singers/performers get you excited for the start of the game and we are looking for the best the area has to offer," said Erin Lawson, Keys Director of Marketing. "I am blown away each year by some of the people who tryout and I expect it to be no different in 2019." Individuals or groups who want to participate in this year's auditions must pre-register by visiting frederickkeys.com. The participation form can be accessed by clicking here. National anthem forms MUST be submitted to Sarah Kleinhans by email, mail or fax by March 5. To email Sarah your form or for any additional questions, reach out to SKleinhans@frederickkeys.com or call 301-815-9917. March 6 is the ONLY day national anthem auditions take place. Due to a large pool of tryout candidates, those who cannot make the auditions will not be eligible to perform in 2019. Video/audio links in lieu of an in-person tryout will not be accepted. All performers will be evaluated by a panel of judges from Key 103, 106.9 The Eagles and Keys staff. Tryout results will be posted on the club's social media platforms. Those who are selected to sing will be contacted to set up a date.